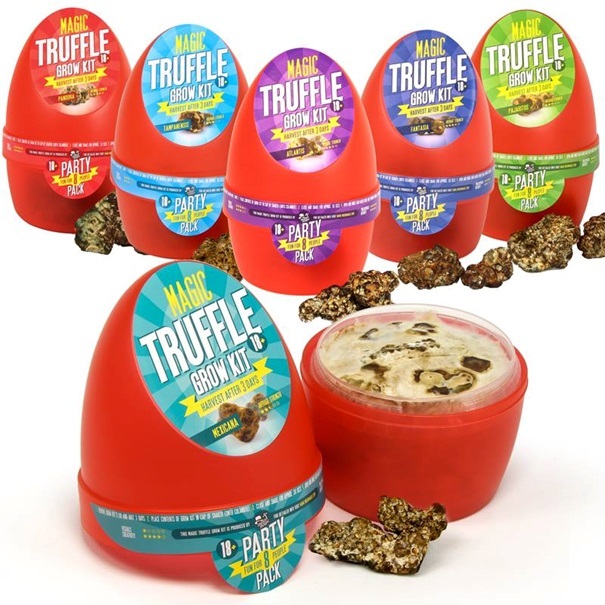 The magic truffle growing kits have been developed to provide the freshest user experience. These kits stay good under very extreme circumstances, and can be harvested within three days or later if you wish. With a kit like this, you always have high quality truffles around. A truffle is a fungus and a fungus is a living organism which continues to grow until it has been harvested. Because the kit contains living truffles, the kit has a shelf life of 8 to 10 months (in a dark place at room temperature). Even better is the fact that the truffles continue to grow until harvested. During this time you don’t have to take care of anything so keep the lid of the inner box closed! Freshly harvested living truffles have the maximum optimal potency. An older truffle harvested days ago will never have the same potency as when it was harvested, and will lose more potency every day, so they have a considerably weaker effect, and don’t taste as good as these! These grow kits have already gone through a growth period of 8 to 12 months. At 8 months, the truffle is ripe, but can continue to grow for 6 more months, they even become stronger because of the evaporation process. Remove the lid of the inner (transparent) box, and keep it open for three days. At first, the truffles will grow a bit more, because they suddenly get a high amount of O2 (oxygen). This eventually stops the growth process. In technical terms we call this a “blow off”. After three days, put the truffle (inner box) contents into the lid of the outer box. Use the holes of the outer box as a strainer, running tap water through it. Rinse it off with cold water until only truffles are left inside the lid. Shake the lid a little while till most of the water is gone. If you aren’t going to eat all the truffles at once, keep them in the fridge. They stay fresh for maximum two weeks. Now you have the freshest and most potent magic truffles you’ve ever tasted! Best consumed within three days! This is our assortment of Magic Truffle Growkits. Or read how to grow Magic Mushrooms in the Magic Mushroom Growkit Instructions.